Project Description: The brick surround and existing mantel were demolished and the limestone slab hearth was removed. Then the firebox was repainted with high-heat Rustoleum. Face and hearth were tiled (my first real tiling job! ), and the oak surround was hand sanded. 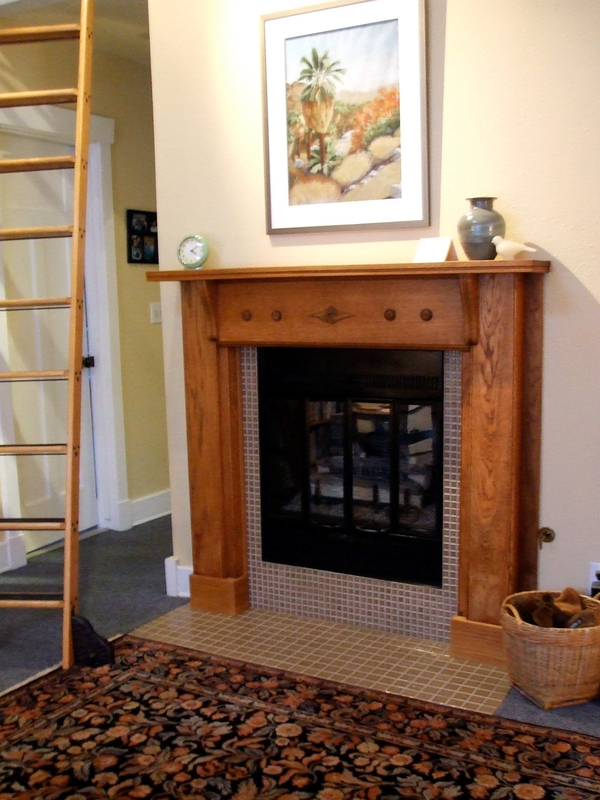 Carpenter Jeremy Hanson provided demolition, tiling prep, and carpentry to retrofit surround, making its legs longer and its mantel depth shallower. He also custom-fit the oak trim. I finish sanded the oak and applied in a beeswax, canuba oil and orange oil, rubbing it to a soft matte finish. Instructions or Advice: What part of your find can you re-use? We were able to re-use pieces of wood that came with the surround as part of the retrofit. A friend donated the tile backing board, and we didn’t have to buy a single piece of new wood to complete the project.